Sure, it looks like a lunchbox, but those aren't sandwiches in there. Evergreen, Japanese provider of cheap electronic tat that is actually quite intriguing at times, has outdone itself with a new product that manages to combine imminent obsolescence with stunning genius. For ¥20,000 (£88), gadget geeks can pick up the company's DN-MRC200T media box, which is basically a hard drive enclosure with memory card slots that is intended to capture media for viewing on portable devices or PCs. Not only does the 160g MRC200T lap up input from any source that can be connected by RCA cables, but it also includes its own TV tuner. As the RCA reference might have suggested, however, the tuner is analogue, meaning it'll be redundant before long. 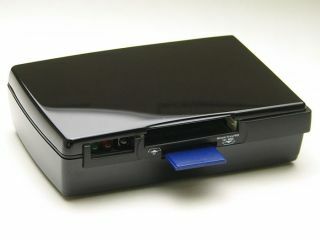 Still, the device can transcode video into a variety of formats, including those suitable for watching on a PSP or iPod. With slots for Memory Sticks, SD cards and CompactFlash and that big space for a 2.5-inch drive of your choosing, at least it's versatile.